DRIERITE (8 mesh) desiccants are made from the naturally occurring mineral, gypsum (Calcium Sulfate), and are available in several varieties designed to solve all types of drying problems. DRIERITE is an all purpose drying agent for the efficient and rapid drying of air, industrial gases, refrigerants, organic liquids and solids. It is used to maintain a dry atmosphere in storage spaces, vaults, commercial packages, and other enclosures; and for the protection of hygroscopic materials or materials subject to mildew, corrosion, rust, or other deterioration caused by high humidity. The bulk density and tapped density of Drierite is the same at 65 pounds/cubic foot. 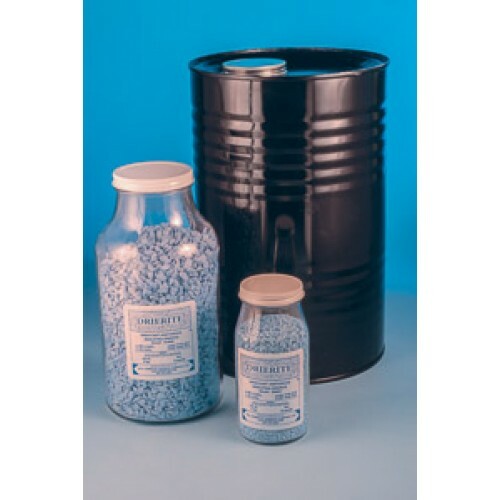 The granular forms of DRIERITE are available in sizes ranging from powder to 4 mesh ( 1 /4 inch granules) weighing approximately 65 pounds per cubic foot, (60 pounds per cubic foot for 200 mesh powder). The powder is very well suited for removing the last traces of moisture from organic liquids and as an additive in polymer formulations. The most popular granule sizes are 200 mesh, 20-40 mesh, 10-20 mesh, 8 mesh, 6 mesh, and 4 mesh granules ("Mesh" means the number of granules per inch). The moisture remaining in gases dried with DRIERITE at 25°C - 30°C is 0.005 mg/liter (data verified by the National Bureau of Standards). Air is dried to a dew point of -100°F. Organic liquids are dried to the low ppm range. There is little change in efficiency at temperatures up to 100°C. For the drying of liquids, DRIERITE instantly absorbs 6.6 weight percent water by chemical action, creating the hemihydrate of calcium sulfate. 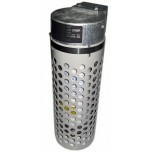 For the drying of gases, DRIERITE has a water capacity of 10 to 14 weight percent. This increased capacity is due to combined chemical and capillary action. DRIERITE granules have 38% pore space volume, which accounts for the additional capacity. Above 6.6%, the capacity varies inversely with temperature and directly with pressure and the partial pressure of water vapor. For the regeneration of Indicating DRIERITE and small lots of Regular DRIERITE , the granules may be spread in layers one granule deep and heated for 1 hour at 210°C or 425°F. The regenerated material should be placed in the the original glass or metal container and sealed while hot. The color of the Indicating DRIERITE may become less distinct on successive regeneration due to the migration of the indicator into the interior of the granule and sublimation of the indicator. Exhausted Commercial DRIERITE or Du-Cal DRIERITE should be spread about 1 inch deep in shallow pans and heated in a oven at 450°F or 230°C for 2 hours to achieve complete dehydration. The regenerated material should be placed in the original container and sealed while hot. The temperature at which DRIERITE desiccants are regenerated is crucial in restoring DRIERITE to its original condition. Absorbed moisture is water of hydration and is chemically bound to the calcium sulfate of DRIERITE. Temperatures in the range of 400°F - 450°F are required to break these bonds and release absorbed moisture. Lower temperatures, regardless of heating time, will not regenerate DRIERITE unless applied under vacuum (26" Hg, 325°F or 28" Hg, 275°F). Care should be taken not to overheat DRIERITE Desiccants. High temperatures can alter the crystal structure and render the desiccants permanently inactive.